uuid : f0028846-57c9-47e2-94c7-28b352e55061 templates_id: 119471 templates_uuid: "8706220b-fdfb-480f-b3dd-1d7c56974d56" title: "Termination of Employment Letter - Create a Dismissal Letter Online" display_name: "Dismissal letter for employees without unfair dismissal rights" meta_keywords: "Termination letter" description: "
Make sure you do things right when you dismiss an employee with this termination of employment letter. This formal notification of dismissal covers the reason for dismissal, such as conduct or poor performance, the date the employment ends, arrangements about holiday and salary, the right to appeal against dismissal, and return of the employer\302\222s property and information. It also allows for payment in lieu of notice (PILON).
" created_timestamp: "2018-10-08 04:36:11.0" modified_timestamp: "2018-10-08 04:36:11.0" active: true created_by: 236 modified_by: 236 dcm_id: 226 url_slug: "Termination-of-employment-letter" meta_description: "Prepare a termination of employment letter using the simple steps from Rocket Lawyer. Make sure you do things right when you confirm the dismissal of an employee." time_to_complete: "10 minutes" role1: "Employer" role2: "Employee"
Make sure you do things right when you dismiss an employee with this termination of employment letter. This formal notification of dismissal covers the reason for dismissal, such as conduct or poor performance, the date the employment ends, arrangements about holiday and salary, the right to appeal against dismissal, and return of the employers property and information. It also allows for payment in lieu of notice (PILON). More than just a Dismissal letter for employees without unfair dismissal rights template, our step-by-step interview and guidance makes it easy to create your document. Easily create online, download, print and sign your free Dismissal letter for employees without unfair dismissal rights in minutes. 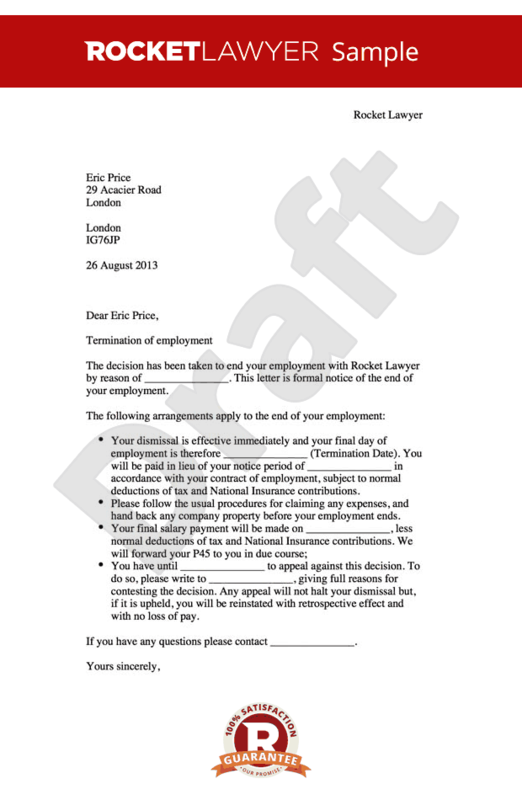 This document is also sometimes called: Termination letter.